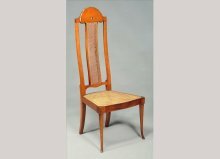 George Montague Ellwood (1875-1955) for J. S. Henry, an oak and inlaid elbow chair and side chair, each marked for J. S. Henry under the seat rails, 111cm and 106cm high See Agius, Pauline 'British Furniture 1880-1915' Woodbridge 1978, p. 96 plate 114 for this model exhibited at an Exhibition in the Dublin Museum 1905. J.S. 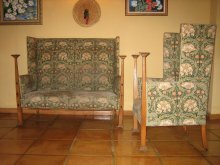 Henry (attributed), an oak and inlaid sofa and armchair, the elongated front supports with square caps, the settee frame only, the chair re-upholstered in a William Morris print, sofa 121cm high, 144cm wide, 75cm deep; the chair 121cm high, 77cm wide, 71cm deep. 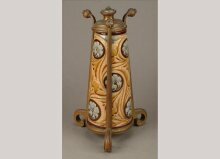 George Montague Ellwood (1875-1955), an oak and inlaid coal purdonium, circa 1905, 71cm high, 47cm wide The handle is after a design by C. F. A. Voysey, who is also known to have designed for J. S. Henry. 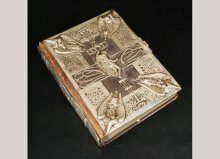 An Arts and Crafts book covers designed by M. Lilian Simpson circa 1894-96 for the Art Union, engraved mark 'ART UNION OF LONDON 1st JANUARY 1896', with silver plated mounts, a hinged clasp and morocco binding, the title page with notes on the designer and design, the remaining leaves blank (with some later use), 24.5cm (9.5in) x 20cm (8in). 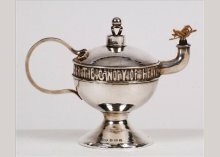 William Hutton and Sons, a pewter and 'Ruskin' heart shape plaque cache pot, stamped mark, no. 01099, 15.5cm high. 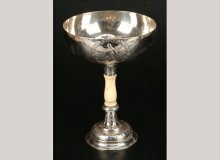 James Powell, Whitefriars (attributed), a part table service of glasses, circa 1900, with wrythen and dimpled bowls, comprising: four hock, 15cm high; seven claret, 12cm high; one sherry, 11.5cm high. 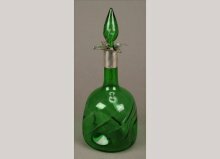 See Dennis, Richard 'Whitefriars Glass, The Art of James Powell and Sons', p. 59, illus. 151. 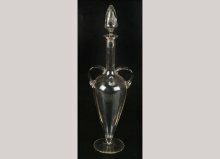 An Arts and Crafts silver plated brass and vaseline and cranberry glass cylindrical hall lantern, with a pierced conical roof and spade cut-outs, 46cm high. 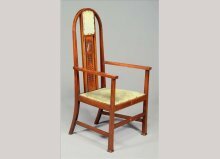 Arthur Heygate Mackmurdo (1851-1942), a very important oak chair, with an Art Nouveau floral back, 99cm high. 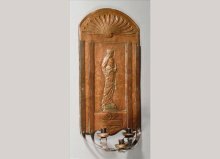 Arthur Heygate Mackmurdo and The Century Guild (attributed), an Arts and Crafts copper wall sconce attributed to Kellock Brown, hammered and embossed with a domed lobed top above a titled figure of 'Winter' flanked by straps forming the three sconce supports below, 74cm high, 34.5cm wide, 15.5cm deep. 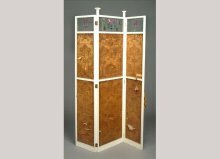 In the staircase of Pownhall Hall is a window that represents the Four Seasons See 'Studio' 1899, p. 190 for two comparable examples. 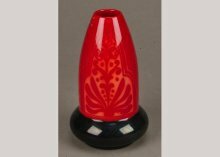 Edith Lupton for Doulton Lambeth, a stoneware and brass table lamp, impressed and incised marks, 34cm high (excluding fitment). 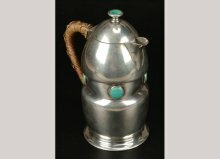 William Hutton and Sons, an Arts and Crafts pewter and turquoise glazed cabochon covered jug, circa 1900, stamped mark, no. 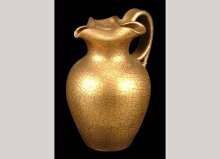 090, 20.5cm high. 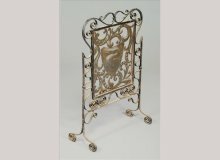 Charles Robert Ashbee (attributed), an Arts and Crafts wrought iron and pierced embossed copper firescreen, with a shield of a pelican to the centre, 82cm high, 54cm wide. 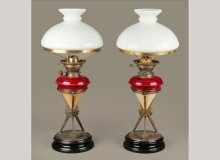 See Sotheby's with Paul Reeves 'The Best of British Design from the 19th and 20th Centuries: The Selling Exhibition' for a comparable fender. 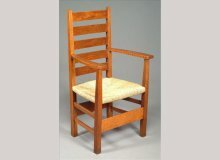 Charles Robert Ashbee (1863-1942) for the Guild of Handicraft, a beech ladderback armchair, with a re-rushed seat, 119cm high; and a single chair en suite. 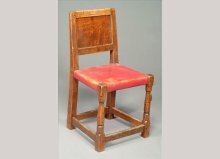 Designed for the dining room of the 'Magpie and Stump', Cheyne Walk, Chelsea, his family home from 1896. One can see the taller ladderback at the head of the table in a watercolour showing the dining room of his house. See Cooper, Jeremy 'Victorian and Edwardian Furniture and Interiors' London 1987, p. 200, illus. 522; Whiteway, Michael and Gere, Charlotte 'Nineteenth-Century Design' London 1993, p. 253, plate 319; and Andrews, John 'Arts and Crafts Furniture' Antique Collectors Club, p. 88, pl. 85. 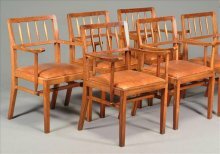 Guild of Handicraft (attributed), a set of four oak and chequer line inlaid side chairs, re-upholstered seats, one stamped 'B49', 89cm high. 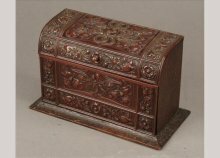 An Arts and Crafts oak and embossed patinated brass stationery box, 24.5cm wide. 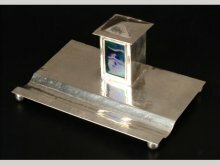 An Arts and Crafts electro-plated and enamelled cigar box, hammered overall, the cover applied with a cut-out 'Cigars' with enamels in blue-green, stamped 'Cambray Ware', 26.5cm (10.5in) wide See Christie's sale 'Arts and Crafts with Liberty and Co' 30th June 2005, lot 107 for a copper and enamel box stamped Cambray Ware. 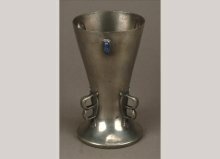 Also see 'Collecting by Design: Silver and Metalwork of the Twentieth Century from the Margo Grant Walsh Collection' Museum of Fine Arts, Houston 2008, p. 18-19, no. 8. 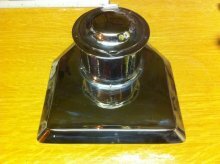 Arthur Dixon for Birmingham Guild of Handicraft, an electro-plated and satin finish vaseline glass adjustable table lamp, 34cm high. 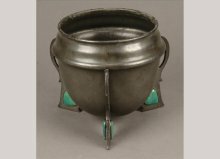 See 'Arts and Crafts Metalwork: Blackwell, The Arts and Crafts House 2003', p. 26 for a bowl on stand with a comparable foot treatment. 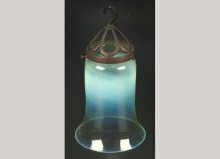 An Arts and Crafts wrought iron and vaseline glass hall lantern, 42cm high. 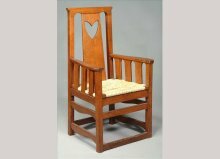 Mackay Hugh Baillie Scott (1865-1945), an oak and inlaid wing armchair, blue cut damask upholstered, the arm supports with chequered inlay panels, block feet. 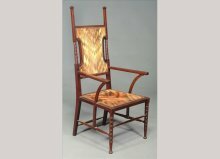 There are two armchairs by M. H. Baillie Scott shown in 'Houses and Gardens', p. 298 and 299 in period pictures of a house Baillie Scott designed called The Garth. Height 44". Depth 20 1/2", Width at arms 22 3/4" Height of arms 28 1/2", Height of seat 19 1/2". 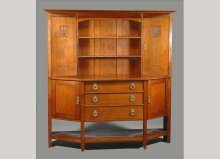 Mackay Hugh Baillie Scott (1865-1945) for J.P. White, an Arts and Crafts sideboard, with stylised floral carved details to the upper doors, stamped 'JPW' to an upper drawer and to the edge of an upper door See 'Furniture made at The Pyghtle Works, Bedford by John P. White Designed by M. H. Baillie Scott' original trade catalogue 1901 No 18 The Daffodil sideboard for a comparable example. 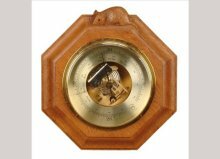 Mackay Hugh Baillie Scott (1865-1945) for J.P. White, a mahogany and inlaid mantel clock case, with mother of pearl, a pagoda top, an inlaid dial and three birds in flight below, 51cm high, 26cm wide, 19cm deep. 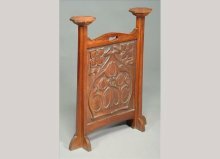 See 'Furniture made at The Pyghtle Works, Bedford by John P. White Designed by M. H. Baillie Scott' original trade catalogue 1901 for the bird motif detail on bluebird cabinet no. 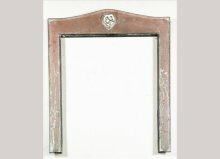 50, a music cabinet no. 31, a work cabinet no. 47 and a cradle no. 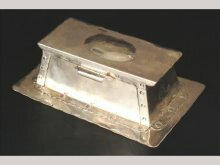 65. 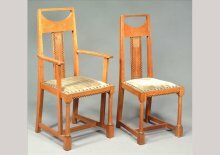 Mackay Hugh Baillie Scott (1865-1945), a pair of stained beech and inlaid armchairs, the tapered slab backs with foliate and ribbon-bordered roundels, flat curved arms, triform seats and square tapered front supports, 84cm high. 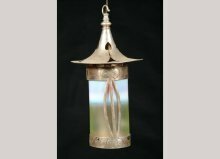 An Arts and Crafts brass and honeycomb vaseline glass hall lantern, 48cm high overall. 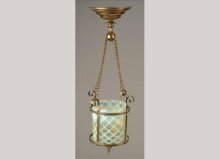 An Arts and Crafts oxidised metal and vaseline glass ceiling light shade, in the manner of the Guild of Handicraft, 27cm high. 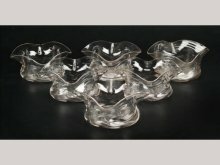 James Powell, Whitefriars, a set of seven glass finger bowls, 11cm wide. 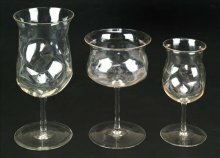 See Evans, Wendy, Ross, Catherine and Werner, Alex 'Whitefriars Glass: James Powell and Sons of London', p. 263, plate 384, item 1. 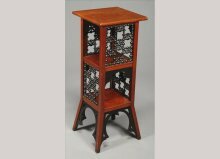 William James Neatby (attributed), a mahogany square plantstand, with elongated uprights, circular caps and stylised plant piercing, 93cm high, 36cm square. 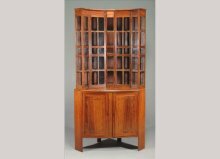 Ernest Gimson (after), a Cotswold School English Walnut and chequer lined corner bookcase, the incurved and angled top with lattice glazing and two doors, the base with two doors, 200cm high, 98cm wide, 73cm deep. See Greensted, Mary 'Gimson and the Barnsleys' 1980, p. 99, fig. 63 for a later rendition which is in Lotherton Hall. 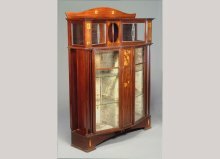 See also Gilbert, Christopher 'Furniture at Temple Newsam House and Lotherton Hall', vol I, London 1978, p. 59, no. 41, illustrated with the design sketch. 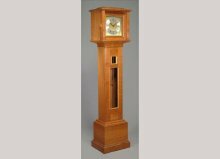 This version of 1903 is in oak and was purchased by Henry H. Peach, Dryad Works, Leicester in 1915. 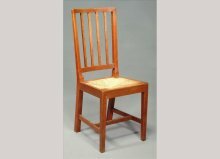 Cotswolds School, an oak dining suite, possibly by Eric Sharp or Gordon Russell, comprising a rectangular dining table, 76cm high, 158cm wide, 82cm deep; six elbow chairs, with re-upholstered leather seats; and a sideboard, 81cm high, 136cm wide, 43cm deep. 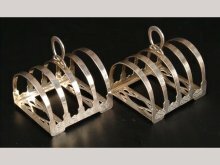 Exhibited at Liberty and Co., June 2009. 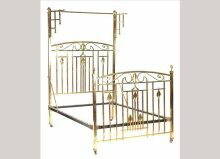 An Arts and Crafts lacquered brass half tester double bedstead, with lattice swing brackets, with stylised plant and scroll headboard and footboard, 221cm high, 136cm wide, 199cm long. 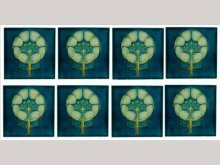 Pilkington's, ten 6 inch tiles, each tube-lined with a stylised foliate design, on a turquoise ground, moulded 'P' mark, 15.5cm. Alfred Stevens (attributed) probably for Hoole and Co., a copper fire insert with a figural sculpted roundel, 82cm high, 68.5cm wide See Sotheby's with Paul Reeves 'The Best of British Design from the 19th and 20th Centuries: The Selling Exhibition' London 14-20 March 2008, PR 28 for another insert by Stevens. 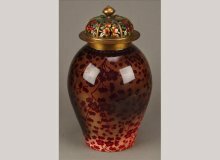 Bernard Moore (1850-1935), a high-fired ruby squat vase, painted with songbirds, painted mark, 10cm high. 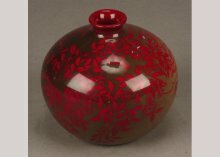 Bernard Moore (1850-1935), a high-fired ruby 'bomb' vase, painted mark, 16cm high. 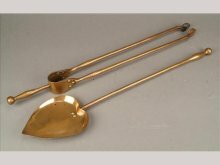 Charles Francis Annesley Voysey for Thomas Elsley, a brass fireplace tongs and shovel, circa 1900, 66cm and 63.5cm long. 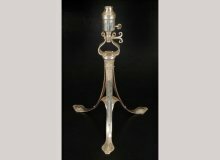 See Gilbert, Christopher 'Furniture at Temple Newsam House and Lotherton Hall', vol 1, p. 145, no. 172. 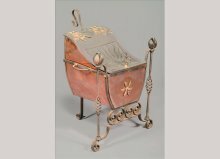 An example exhibited in the Arts and Crafts Society Exhibition, 1902. 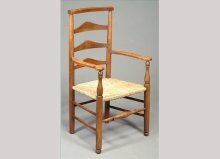 George Walton (1867-1933), a walnut 'Philipines' high back side chair, with a cane back and seat, 124cm high Designed by Walton for The Philipines, a house in Braxted Chart, Kent 1902-05. Illustrated in Andrews, John 'Arts and Crafts Furniture' Antique Collectors Club, p. 102; and Moon, Karen 'George Walton: Designer and Architect' Oxford 1993, p. 120, pl.157. 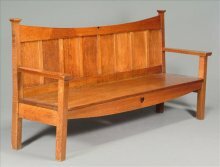 George Walton (1867-1933), an important oak panelled bench for the Eastman Kodak London showrooms, 140cm high, 152cm wide, 143cm deep. 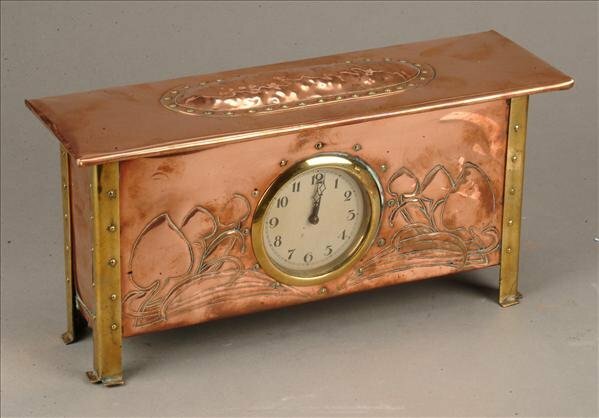 George Walton (attributed), an Arts and Crafts embossed copper and brass mantel clock, retailed by Goodyers Ltd, 19cm high, 37cm wide. 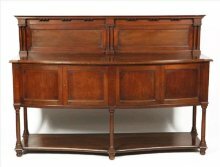 George Walton (1867-1933) for Liberty and Co (attributed), an Arts and Crafts mahogany bowfront sideboard, hammered brass handles, ivorine label to back, 135cm high, 189cm wide, 61cm deep. See Morris, Barbara 'Liberty Design', p. 120 for an illustration of a dining room executed by Liberty and Co., 1906. This watercolour is also reproduced in 'The Studio Yearbook of Decorative Art 1906'. 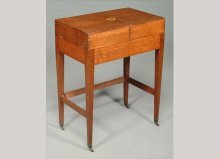 George Walton (1867-1933), an oak small fold-out desk, circa 1899, with a copper heart lockplate, twin hinged flaps, a hinged leather inset writing surface, a pen rest and inkwell, on square tapering supports with stretchers and casters, 78cm high, 61cm wide, 37cm deep (closed). See Moon, Karen 'George Walton: Designer and Architect' Oxford 1993. 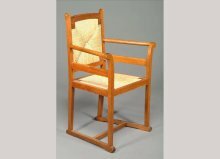 Originally designed for George Davidson's home Beechcroft and then Wern Fawr, see illus. no. 186, p. 140. 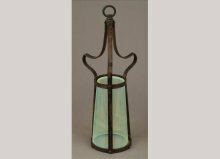 An Arts and Crafts hammered copper semi circular stickstand, with embossed foliate roundels, 78cm high, 42cm wide, 16cm deep. 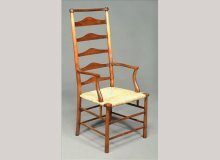 Liberty and Co. (attributed), an Anglo-Japanese walnut armchair, with wavy arm supports and arms that follow through to the side stretchers, 123cm high. 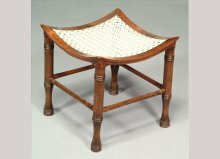 Liberty and Co., a walnut Thebes stool, with a re-strung dished seat, a spindle gallery, on four legs, 39cm high, 37cm square. 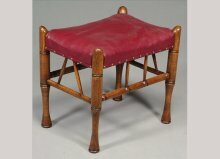 Liberty and Co. (attributed), a stained beech Thebes stool, with a re-strung dished seat, on four legs, 38cm high, 37cm square. 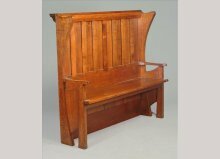 Liberty and Co. (attributed), a mahogany open arm chair, in the manner of Edward William Godwin, with later studded upholstery, 124cm high. 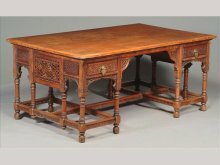 Collinson and Lock, a rosewood and line inlaid circular table, in the manner of E.W. 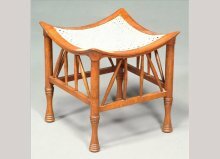 Godwin, circa 1890, with a shaped apron, on five turned and tapered supports joined by stretchers. 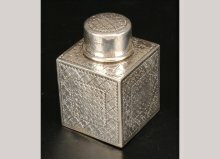 See Christies Sale No 5971, 8th July 2009. for an identical inlaid version stamped 'Collinson & Lock, London, 253'. Exhibited Liberty and Co. Annual Arts and Crafts Exhibition, June 2009, fig. 15. 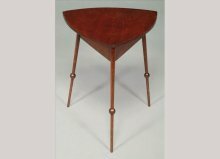 Liberty and Co (attributed), a mahogany triform occasional table, in the style of Edward William Godwin, 56cm high, 47cm wide. 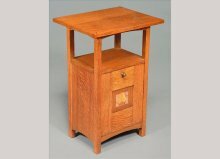 Liberty and Co (attributed), an oak square occasional table, in the style of Edward William Godwin, 56cm high, 39cm square. 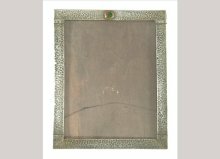 Liberty and Co. (attributed), a hammered pewter and enamel rectangular photograph frame, 34.5cm high, 28.5cm wide. 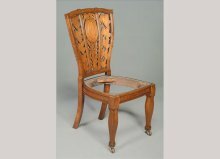 An Arts and Crafts mahogany and inlaid armchair, possibly by Liberty and Co., with carved stylised plant motif to the central splat, 120cm high. 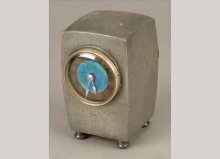 Liberty and Co., a hammered pewter and enamel small clock, with an integral key wind timepiece movement, stamped 'English Pewter Made by Liberty and Co.', no 0756, 10.5cm high. 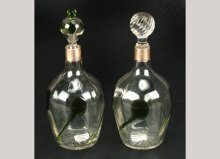 Archibald Knox for Liberty and Co., a pair of embossed pewter bombe vases, one stamped 'English Pewter', no. 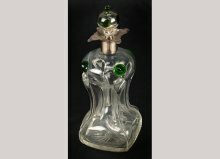 0226, 19cm high. 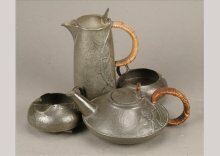 Archibald Knox for Liberty and Co., a 'Tudric' pewter four-piece tea service, stamped marks, no. 0231, the teapot 25.5cm long. 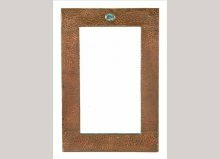 Liberty and Co. (attributed), a hammered copper and 'Ruskin' plaque rectangular wall mirror, 40.5cm x 27.5cm overall. 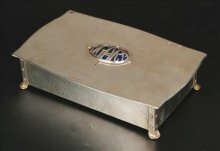 Liberty and Co., a pewter and sodalite cabochon vase, stamped 'Made by Liberty and Co English Pewter 038', 18cm high. 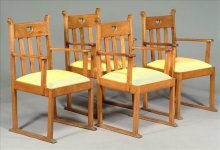 Liberty and Co. (attributed), a set of four oak armchairs, in the manner of E. Punnett, with heart cut-outs, re-upholstered drop-in seats, sled feet, 97cm high. 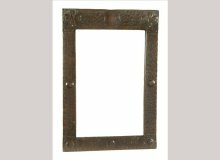 Liberty and Co (attributed), an Arts and Crafts copper rectangular wall mirror, spot hammered and embossed with roundels and fleurs de lys, 58cm high, 39cm wide. 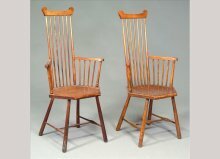 Liberty and Co, a pair of beech high comb back elbow chairs, with dished hexagonal seats, on tapered supports with H-stretchers, one with ivorine label, 113cm high. 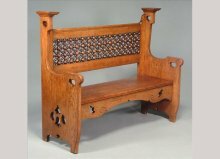 Liberty and Co., an oak settle, with a mushrabiya back with heart and other cut-outs, 116cm high, 147cm wide, 53cm deep. 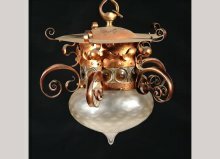 An Arts and Crafts copper and glass ceiling light, in the manner of C.R. 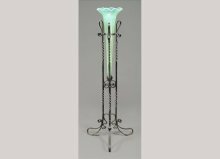 Ashbee, circular with overhanging cornice, scroll brackets, bull's eyes band and a green tinted and honeycomb moulded lower shade, approximately 50cm high, approximately 55cm diameter. 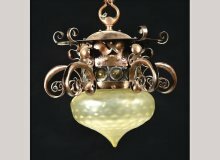 An Arts and Crafts copper and glass ceiling light, in the manner of C.R. 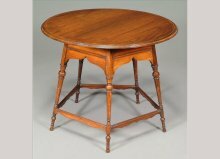 Ashbee, circular with overhanging cornice, scroll brackets, bull's eyes band and a honeycomb moulded lower shade, approximately 50cm high, approximately 55cm diameter. 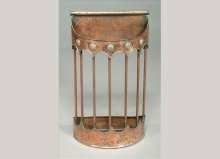 An Arts and Crafts hammered copper coal box and cover, circular with scroll strap handles, the swept lid embossed with sunburst and open spiral handle between stylised tulip finials, 39cm high. 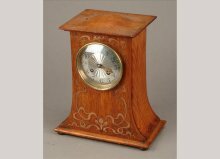 Robert 'Mouseman' Thompson (1876-1955), an oak octagonal aneroid barometer, with a German double diaphragm movement, 21cm wide. HICKORY DICKORY DOCK, THE MOUSE RAN UP THE CLOCK. Height 76" 194cm, Width 18", Depth 13". 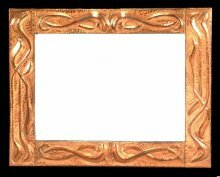 An Arts and Crafts hammered copper rectangular wall mirror, circa 1905, embossed with stylised foliage, 64cm high, 80cm wide. Henry Stacy-Marks, a highly important English painter of portraits and birds. 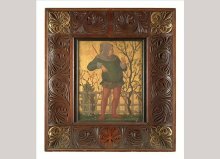 An oil on gilded panel in the medieval style of a gentleman passing his loved one a flower, 29cm x 23cm, in a carved walnut and parcel gilt frame, 51.5cm x 47cm overall. One of a pair. Marks had a reputation for his high spirits and conviviality. He enjoyed success as a painter of Shakespearean and historical subjects and later, ornithological pictures. Henry Stacy-Marks, a highly important painter. 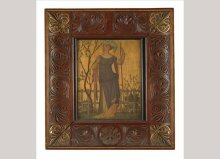 An oil on gilded panel in the medieval style of a lady receiving a flower from her loved one, 29cm x 23cm, in a carved walnut and parcel gilt frame, 51.5cm x 47cm overall.